Ok, so you have the midcentury modern house. How about furnishing it? If that’s your next step, check out our pick of the midcentury modern sideboards on the high street and online. Something for every budget. 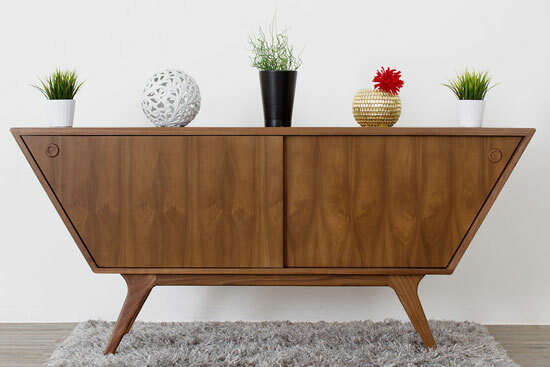 If you think midcentury modern sideboards, you probably think of something like this design. 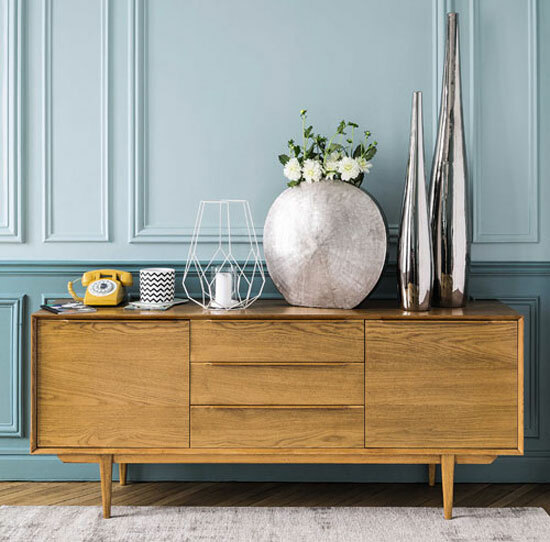 Looking not unlike a vintage piece, this sideboard is made of oak, with three middle drawers and two storage areas behind the two side doors, each with an adjustable shelf. £799.90 for this one. 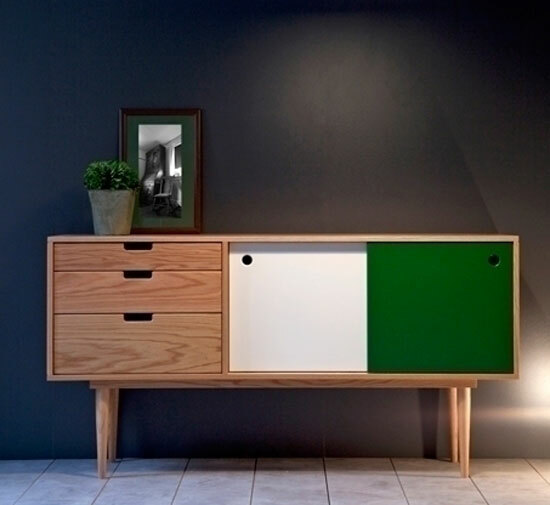 From something obvious to something very different to typical midcentury modern sideboards and in some ways, very modern. 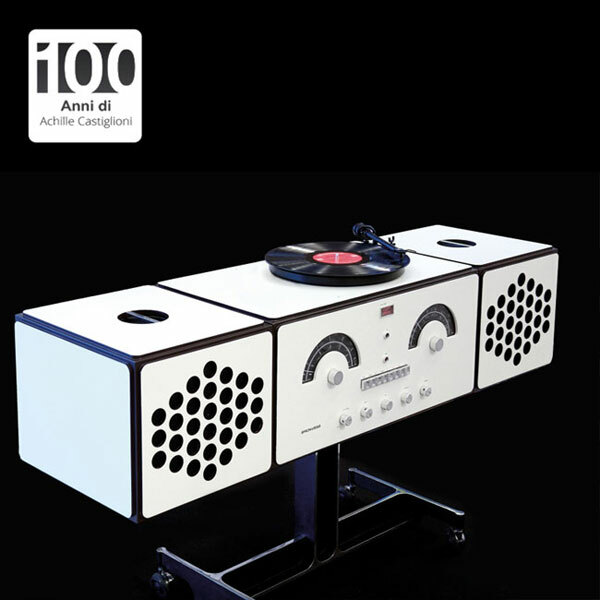 The midcentury look is there, but so is the colour, a built-in high quality audio system, a wireless Bluetooth receiver and audio inputs. 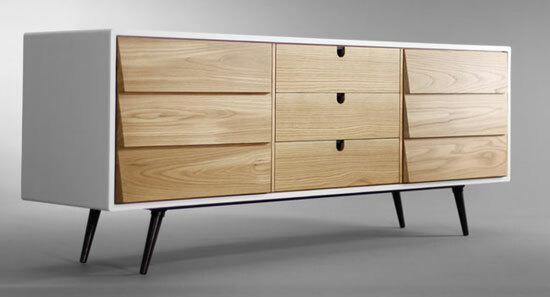 You can get it as a horizontal or vertical sideboard, with prices starting at £2,680. Another design that might be out of a vintage shop window. 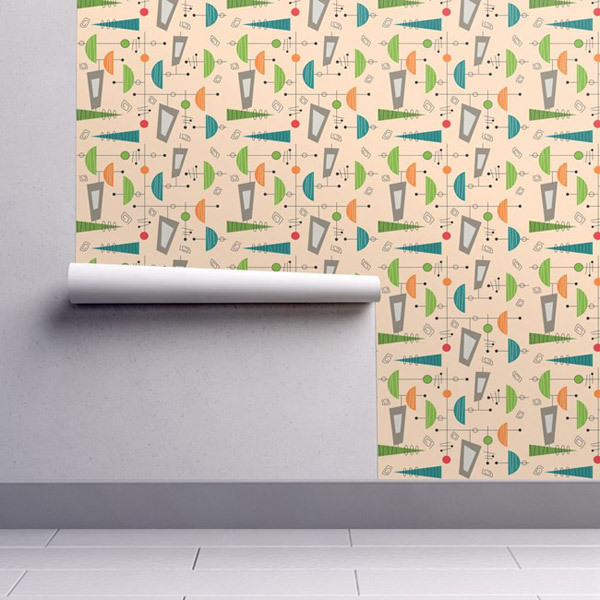 There are actually two sizes of this design, but the larger one does it for us. 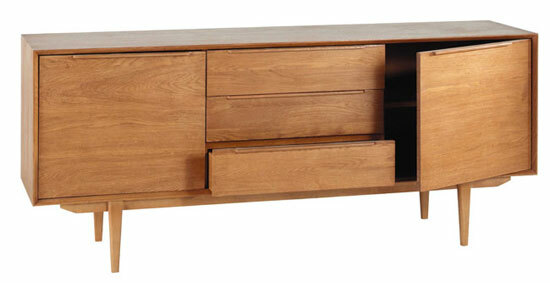 A 1960s look and with tapered feet, four drawers and two sliding doors, as well as a removable shelf. £849 is the list price. Not the most spectacular design, but definitely a finish worth talking about. 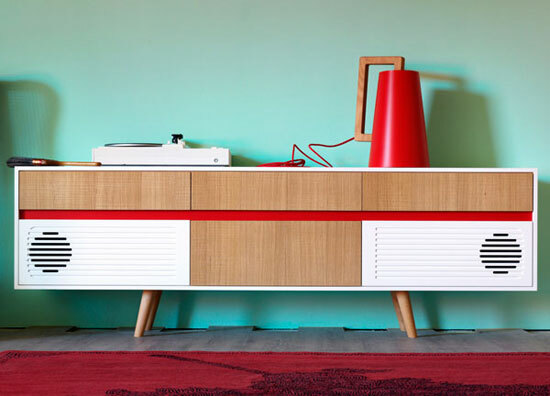 It’s a a collaboration between designer Nick James and artist Bridget Jones, who has added in a limited edition screen printed Formica for the front on the European oak cabinet. Looks amazing. So many interesting designs from sellers on Etsy, but we have gone for this piece from Habitables. A handmade piece made of solid oak with a white lacquer on the outside and some contrasting tapered legs. Plenty of storage options of course. Around £2,348 for this one. 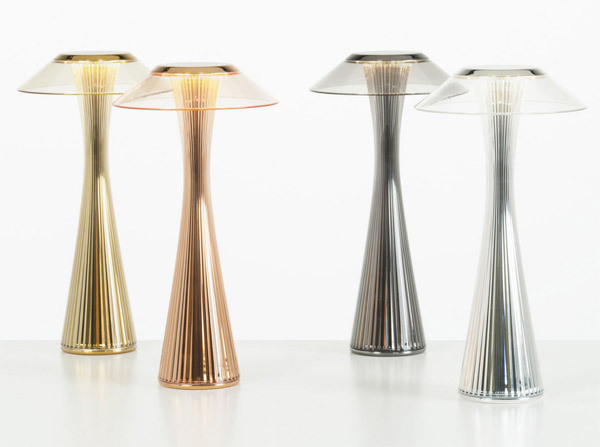 Check out the other designs by the maker too, which are equally stylish. 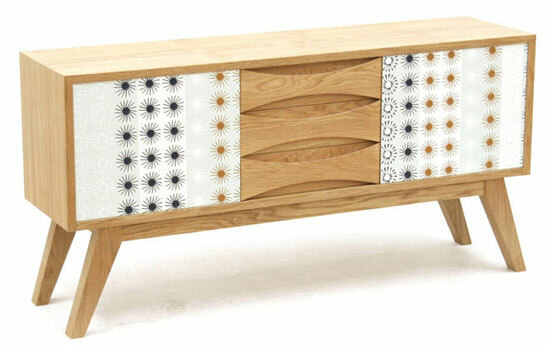 I think we could have done a top 10 from Swoon Editions designs alone when it comes to midcentury modern sideboards. But after some serious thinking, we have gone for the one above. There is a midcentury / Scandinavian vibe here, with the rosewood frame contrasted with those grey drawers. Lots of storage both inside and on top too. If this doesn’t work for you at £599, Swoon has many others that just might. If you want something a little more compact and simple, check out this one at Made. A light oak sideboard, it has a has a two-door cupboard with one shelf and three drawers, but without too much of a footprint. Cheaper than many too. 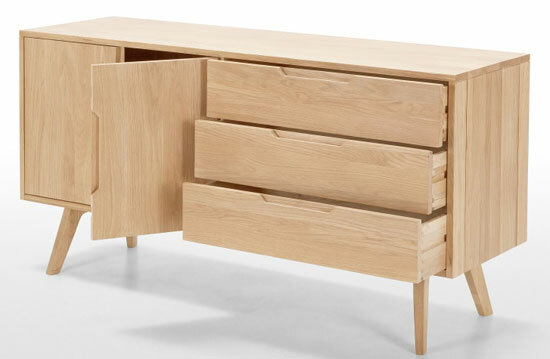 Another on the affordable side is this one from (you guessed it) John Lewis’ affordable furniture range. But it looks more expensive than it is. Again, on the compact side, it has a mix of cupboard and drawer, with the ‘wow’ coming from the grey frontage in a variety of shades. £499 for this one too. I have seen these discounted at Monoqi, but if they are on longer there, you can order one of your choice direct from the maker. Vintage Scandi looks splashes of colour, skin tapered legs and everything made to order. Check out the rest of the retailer’s designs for variations on the theme. €1,990 is the price of this one. Finally, if you want something a little OTT, go see Joybird. 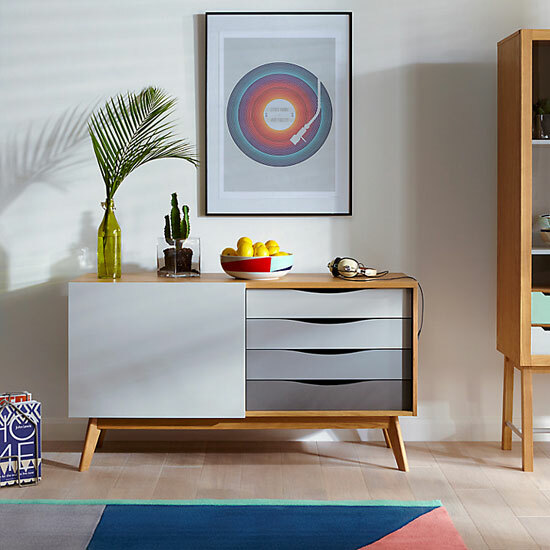 The US maker and retailer has this stylised midcentury design worthy of a place in The Jetsons’ house on its shelves right now. 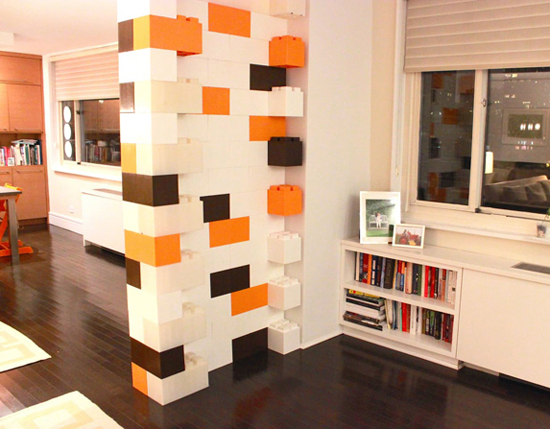 Angles aplenty, but beyond the headline looks is a very functional piece of furniture with plenty of storage. $2,499 is the asking price. Of course, you can also buy vintage. 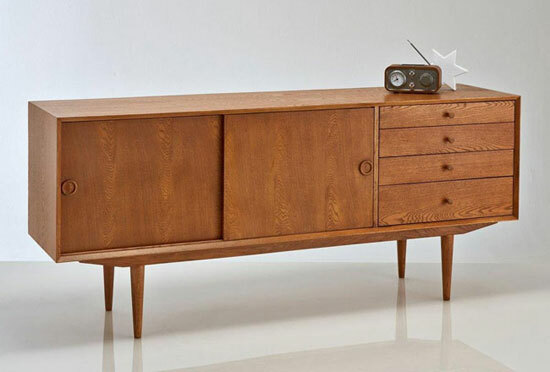 In fact, there are hundreds of midcentury sideboards on eBay at pretty much anytime. Or just try and get lucky at your local house clearance place.